A world-renowned therapist, Mira Kirshenbaum has treated thousands of people caught in the powerful drama over what to do when an affair rocks their emotional lives. 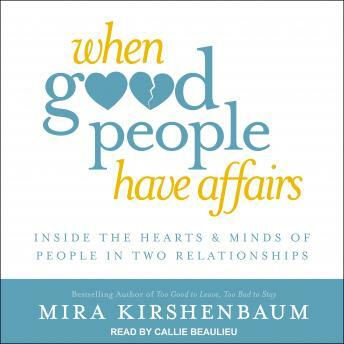 Now, in When Good People Have Affairs, Kirshenbaum puts her unsurpassed experience into one clear, calming place. She leads listeners through six easy-to-navigate steps that will take anyone from anxiety to clarity, and identifies seventeen types of affairs, helping listeners figure out which type they're in and what it means. (Is it a 'see-if' affair? Ejector-seat affair? Distraction affair? Unmet-needs affair? - What am I missing in my marriage? - How do I decide between two people when it's like comparing an apple to an orange? - How do I decide to end my marriage, end my affair, or end them both? This book gave me the answers!